HAVE A FLICK through our new issue by clicking here and feel instantly warmer and more cheerful, however bad your hangover! 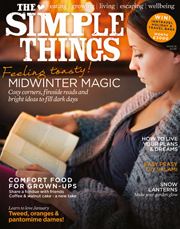 On sale from 3rd January in all major supermarkets, WHSmith, M&S and larger newsagents. With all good wishes for 2014 from The Simple Things.